We're happy to announce that after a long time of development, the ultimate tool that makes installing, updating and playing Median as easy as can be, is finally ready for a beta release. This app will eventually become the standard and mandatory way to run Median. - Installs Median on any Diablo II: Lord of Destruction version. - Automatically keeps median version up-to-date. - Verifies for corrupted files & installation. - Settings page to set video mode, windowed, and several other configurations. - News feed, with links to the community and documentation. 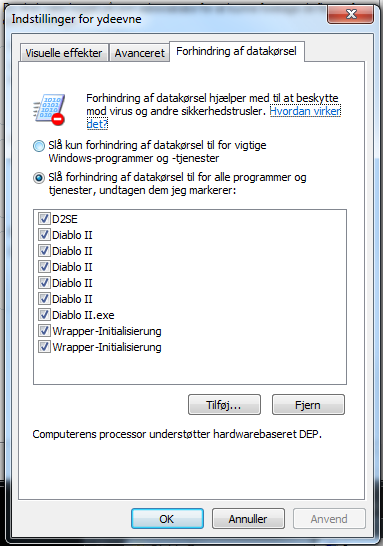 - Solves many compatibility issues with Diablo II (mainly when the launcher is run as admin). - Sets Diablo II realm gateway to The Sin War. - Allows up to 2 instances of Diablo, for muling purposes. With this app, we intend to make Median & multiplayer easy to install for everyone, and get rid of all (or most) issues that are caused by faulty installations, wrong versions, windows issues, or Blizzard patches (1.14 grrr). The launcher is currently in a beta phase, please test the app and report bugs in this topic. Big thumbs-up to Quirinus for his amazing work developing this tool. Thank Marco for the slick design. Let us know if you find any bugs, and post any suggestions you have in mind. Hmm, there's no readme file on how to properly use it, in which folder to put it etc. Sorry if it sounds noobish, but I'm not that experienced in all this sort of things. Right now I have 'access denied' error after clicking, though all programs I have have always been run as administrator. What to do? Stealthmaster wrote: Hmm, there's no readme file on how to properly use it, in which folder to put it etc. Sorry if it sounds noobish, but I'm not that experienced in all this sort of things. Right now I have 'access denied' error after clicking, though all programs I have have always been run as administrator. What to do? It's a setup file, you can run it from anywhere. EDIT: And when that happens I can't click on Settings anymore. Tried with and without "run as admin". Install successful without errors. 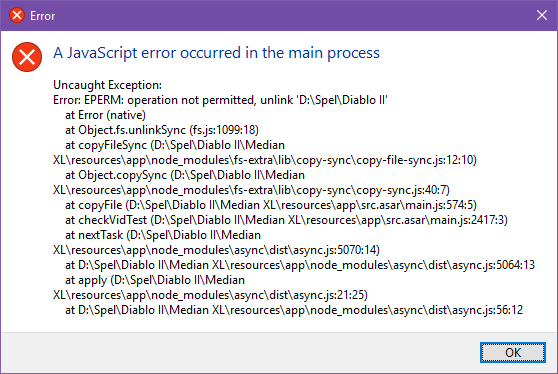 This shows up when the program is launched. Main form opens without further issue once error dialogue is closed. Front page, game guide, forums, and all three news boxes work, opening a new tab in the default browser (tested with edge and chrome). Settings greyed out. Version Unknown, with a spinning icon above that's been going for over ten minutes. Only gripe is that it doesn't behave like a standard window: maximising and moving does not automatically un-maximise it, and moving it to the edges doesn't give the option of having it take up half the screen. Using Windows 10 if that matters. Edit: making 'settings.json' read-only causes an error upon exiting. Three instances of 'Median XL (32 bit)' remain as background processes in task manager. Program won't start again until those three are closed manually. Edited by Kyromyr 2 years. Marco wrote: It's a setup file, you can run it from anywhere. I'm using Win XP. Could this be a problem? Re-download, it should work now. This should probably be solved now, re-download. Kyromyr wrote: Install successful without errors. This shows up when the program is launched. Main form opens without further issue once error dialogue is closed. Front page, game guide, forums, and all three news boxes work, opening a new tab in the default browser (tested with edge and chrome). Settings greyed out. Version Unknown, with a spinning icon above that's been going for over ten minutes. 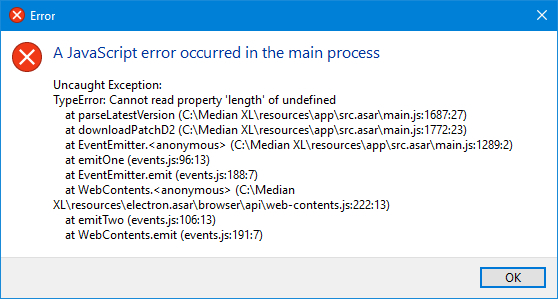 If there's an error_log.txt, could you pm me what it says? Yeah, I'm aware of the max thing. The settings.json shouldn't be read-only, the launcher writes settings there. If it's spinning, you can stop it after like 1 min. Thanks for the reports guys! Note: This is with a completely fresh D2 install with D2LoD113 patch applied. All D2 processes are run as admin. Is there any other process that i have to add? I tried adding the Median XL Launcher exe file, but i can't for some reason. This does not happen when using D2SE. I have an error with glide when using the MXL Launcher. D2SE: Keep Desktop Composition on = D2 runs just fine. D2SE: Keep Desktop Composition off = D2 runs just fine. 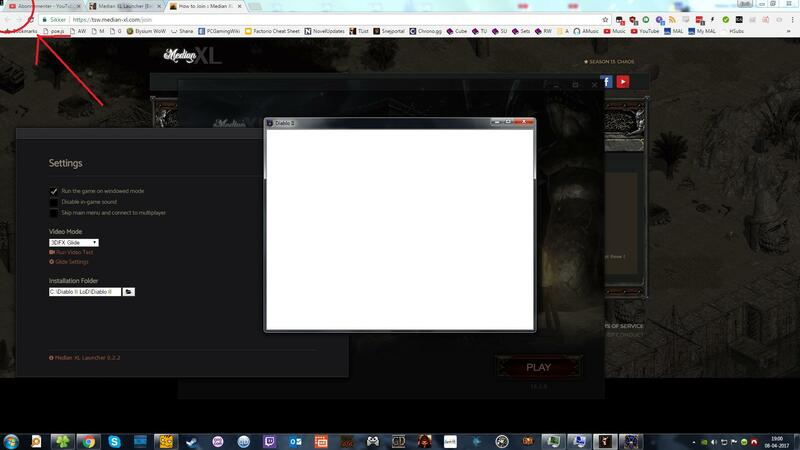 MXL Launcher: Keep Desktop Composition off = D2 runs just fine. All other glide settings are exactly the same. D2 is already added in Data Execution Prevention and run as admin in both cases.